WILLEMSTAD – Parliament clerk Silvin Cijntje has called a parliamentary meeting for Friday. Major topics include the resignation of the current president and vice-president and the election of their successors. There will also be a debate with the outgoing Ministers Camelia-Römer of Traffic, Transportation and Spatial Planning and Gijsbertha of Finance, about the situation with the local airline InselAir. That subject was on the agenda for today’s meeting, but it was provisionally suspended by the President of Parliament Giselle McWilliam. The invitation for the meeting on Friday was sent at the request of 11 Members of Parliament. In addition to the fractions of MFK, Korsou di Nos Tur (KdNT) and Pueblo Soberano (PS), Marilyn Moses of Movementu Progresivo and Independent MP Edward Braam also requested the meeting. MFK political leader Gerrit Schotte stated during an interview that it is important to convene to elect a new President of Parliament and a Vice-President who can count on a new majority of 11 seats. 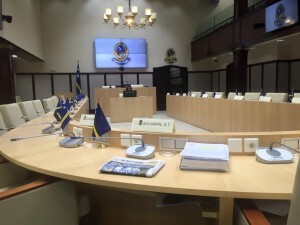 Whether the new majority will file a motion of no confidence against Prime Minister Hensley Koeiman and his government is not yet known. This motion means that the new majority will have to form a government until the elections of April 28 this year.